It was reported to me early this morning by a source (who shall remain nameless at this time due to the fact that is just sounds dramatic) that Pink Scooter Girl a.k.a. Pink Power Ranger was spotted "scootering" around the Plano area. Now, this brings to question, could this be "my" scooter girl who was sighted by me on Hwy 80 around the Mesquite /Sunnyvale area? Plano may be a little far for it to be "her", but according to my source, she has blonde hair, pink scooter, and pink helmet. My source said she was coming towards her so she was unable to see if there was a Disney decal on the back of the helmet which would prove undeniably that this is indeed "my" pink scooter girl. This is an article in Max Sports and Fitness magazine. She actually "posed" for the different exercises mentioned, but you have to buy the magazine to see those. I've been working out with her since late February. I am not her most challenging client, but probably a little frustrating. I get on a roll for about 2 weeks with my exercise routine, then I slack for a week, and I have to start all over. I do all the exercises she asked me to, but there have been several times I've gotten really frustrated. She just keeps smiling. If I can really get focused and get some of this weight off, I will join a contest the gym has every year starting in February. I have a lot of work to do!!! I didn't realize how fun it would be. Before I started blogging in July, I never read blogs. Oh, I might have read the writer from Grey's Anatomy's blog, but that was only because my friend sent it to me. I never saved it or "stalked" it. Now, I'm not only reading other blogs, but stalking as well for ideas on how to improve my blog. How do you think I found my new background. (Don't be surprised when if it changes as I find cooler styles I like). 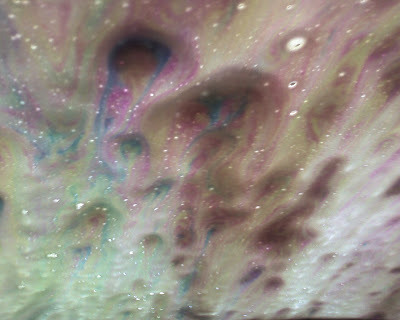 Thanks to my friend, Jen, I have a new appreciation for the details of the world around me. I notice the smallest of details. Like the other day, it was steak night at dad's -I was on FM 429 - a two lane road - and there it was a poor dead armadillo on it's back with it's legs up in the air. I had to turn around, and get out of the car to take the picture. I put the flashers on - and thank goodness, no cars came by. I almost included it with the post, but it doesn't post well. And then today, I was driving down FM740 - coming home from the gym, and there in front of a house was a used toliet with a FREE sign on it. An awesome photo shoot.. but I do not have a digital camera - and my cell phone battery was dead (which has been the camera used for almost all photos on this blog - which explains the poor quality of some of the pictures). Plus, the road was very busy and narrow which would make a photo shoot very dangerous. Anyway, please be patient with my blog. I am learning new things all the time. What I'm finding is that there are so many fun things to do with your blog, and so far, everything has been quick and easy. Otherwise, believe me, this blog wouldn't even exist. Cook fusilli pasta in large pot of boiling salted water until just tender but still firm to bite. Drain. Rinse pasta with cold water to cool. Drain. Transfer pasta to large bowl. Add 1 1/2 tablespoons olive oil and mix thoroughly to coat. 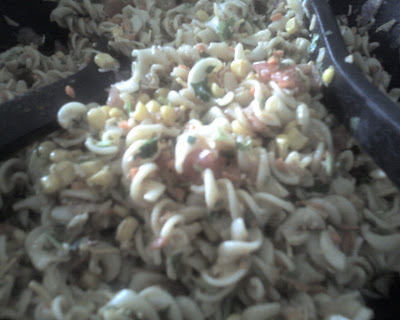 Add diced tomatoes, corn kernels, carrot strips, and chopped onion. Toss. Mix mayonnaise, dijon mustard, and fresh lime juice in small bowl. Mix in minced jalapenos, chili powder and ground cumin. Add dressing and chopped fresh cilantro to salad. Mix to blend. Season to taste with salt and pepper. Preheat oven to 350 degrees. Spray 9-inch tart pan with removable bottom with non-stick cooking spray. Grind graham crackers with 3 tablespoons butter and honey in processor until fine crumbs form. Press crumbs evenly onto bottom (not up sides) of prepared tart pan. Bake until set, about 10 minutes. Cool. Bring cream just to a boil in small saucepan. Reduce heat to low and simmer 5 minutes. Place chocolate in medium saucepan. Pour hot cream mixture into saucepan with chocolate. Stir over medium-low heat just until melted and smooth. Add cocoa powder and remaining 1 tablespoon butter; stir until melted and smooth. Pour chocolate mixture over crust in tart pan. Chill at least 45 minutes (chocolate will be slightly soft after 45 minutes and firm after 2 hours). Cut into wedges and serve. Note: Can be made 1 day ahead. Cover and keep chilled. Let stand at room temperature 1 hour before serving. I will admit that I went into this season (I believe it's Season 7 ) with some skeptism. Well, I love the new contestants. I think Rocco is dahling - even though he isn't a good dancer. I voted for him anyway. I think several times. I also love, love, love Warren Sapp. Brooke Burke is a good dancer, and soo pretty. Ok, I'm going to put it out there - was Cloris Leachman drunk? The volleyball gold olympic winner was bigger than I thought. She sure didn't look so tall and big in the skimpy teeny weeny bikini playing volleyball in China. I think she is cool though, maybe a bit awkward, but I voted for her, too. This is hilarious.. it's about 6 minutes.. so plan your time wisely - I promise, it will not disappoint. Abby (my niece) turned 6 years old on 9/18. We celebrated her birthday at Grandpa's. 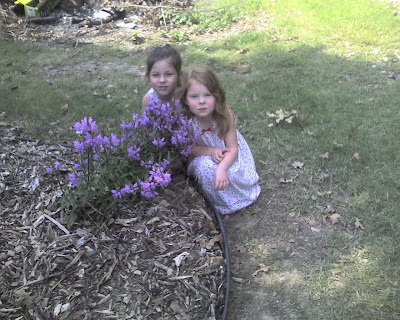 Abby and Stephanie at Grandpa and Bev's garden. I love Pink. It is one of my favorite colors. I love pink and brown. I love pink and black. 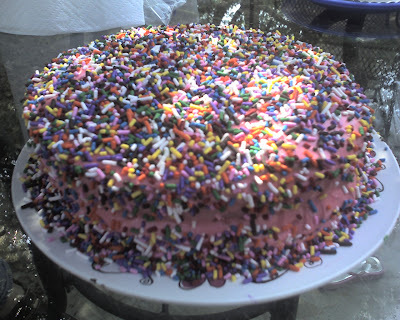 I love pink as an accent, pink pajamas, cotton candy, pink fingernail polish, pink flowers, pink underwear, pink umbrellas, pink galoshes, pink dishes, pink buttercream frosting on thumbprint cookies at Celebrity Bakery, and I even own a pink Dallas Cowboy baseball cap. 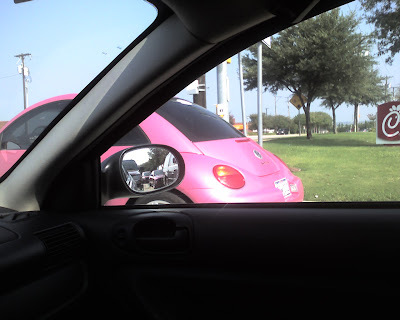 I currently am coveting a pink Dallas Cowboy Marion Barber jersey... but.... pink has it's place..and it is not on a vehicle..
Disclaimer: Please do not attempt taking pictures while driving. This picture was taken at a stop sign. (Obviously, since it's so clear and not blurry at all).